Here are two natural products that help relieve muscular aches and pain. Neither contains drugs, or causes side-effects. After applying, they don’t sting or burn, have no perfumes or odor. TOPRICIN is a regulated, natural medicine that relieves muscular and joint pain without side-effects. Applied topically, Topricin ointment helps the healing process by improving blood flow to the injured tissue. 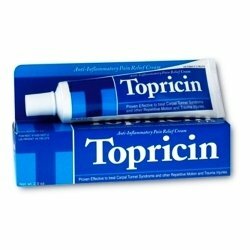 Topricin Uses: Achilles Tendinitis, Arthritis, Back Pain, Bruises, Bursitis, Carpel Tunnel Syndrome, Fibromyalgia, Heel Pain, Impact Injuries, Leg Cramps, Minor Burns, Nerve Pain, Neuromas, Overuse, Plantar Fascitis, Sciatica, Scrapes, Sports Injuries, Sprains, Strains, Tendinitis. TRAUMEEL is a homeopathic, odorless topical ointment that is available in a white cream or gel forumula. It is used for natural pain relief. 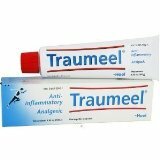 Traumeel Uses: Bruises, Joint and Muscular Pain, Sports Injuries. Posted on November 6, 2012, in Recommended Products and tagged arthritis, homeopathic ointment, muscular aches and pain relief, natural pain relief, Pain management, sports injuries, temporary pain relief. Bookmark the permalink. Leave a comment.